Portions of the Bay of Fundy, Shepody Bay and Minas Basin, form one of six Canadian sites in the Western Hemisphere Shorebird Reserve Network, and are classified as a Hemispheric site. It is administered by the provinces of New Brunswick and Nova Scotia, and the Canadian Wildlife Service, and is managed in conjunction with Ducks Unlimited Canada and the Nature Conservancy of Canada. 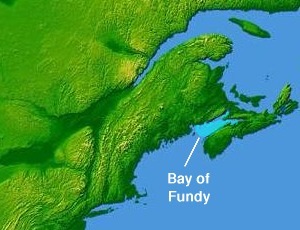 Some sources believe the name "Fundy" is a corruption of the French word Fendu, meaning "split",  while others believe it comes from the Portuguese funda, meaning "deep". 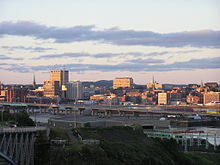 The bay was also named Baie Française (French Bay) by Samuel de Champlain during a 1604 expedition to St. Croix Island. According to the Canadian Hydrographic Service, there is a 16.8-metre (55-foot) tidal range in Leaf Basin for Ungava Bay and 17 metres (56 feet) at Burntcoat Head for the Bay of Fundy. The range at Leaf Basin is higher on average than at Minas Basin; however, the highest recorded tidal ranges ever measured are at Burntcoat Head and result from spring tides measured at the peak of the tidal cycle, which occurs every 18 years. 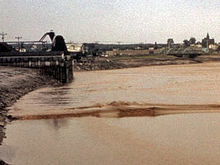 The highest water level ever recorded in the Bay of Fundy system occurred at the head of the Minas Basin on the night of October 4–5, 1869 during a tropical cyclone named the " Saxby Gale". The water level of 21.6 metres (71 feet) resulted from the combination of high winds, abnormally low atmospheric pressure, and a spring tide. Cape Chignecto defines Chignecto Bay whereas Cape Split defines the Minas Channel, leading to the Minas Basin. The Minas Channel connects the Minas Basin with the main body of the bay. The channel is 5.6 kilometres (3.5 mi) across and approximately 106.7 metres (350 ft) deep. The tides that flow through the channel are very powerful. They are as powerful as 8,000 train engines or 25 million horses. Facing Cape Split at the entrance to the Minas Channel are the basalt cliffs of Cape d'Or. During the American Revolution in the late eighteenth century, American privateers raided the English villages along the shores of the Bay of Fundy, such as the Raid on St. John (1775), the Battle off Cape Split and the Raid on Annapolis Royal (1781). After the War, the boundary between the United States and the newly created province of New Brunswick remained uncertain, resulting in a thriving smuggling trade in the region, especially on the waters of Passamaquoddy Bay. The War of 1812 resulted in actions on the Bay of Fundy, mostly in the form of privateering and small patrol ships. After the War of 1812, the smuggling resumed and culminated in the so-called "plaster war" of 1820. ^ Yeo, R.K.; Risk, M.J. (March 1, 1981). "The sedimentology, stratigraphy, and preservation of intertidal deposits in the Minas Basin System, Bay of Fundy". Journal of Sedimentary Petrology. 51 (1): 245–260. doi: 10.1306/212F7C5C-2B24-11D7-8648000102C1865D. ^ a b Klein, George DeVries (December 1, 1963). "Bay of Fundy intertidal zone sediments". Journal of Sedimentary Petrology. 33 (4): 844–854. doi: 10.1306/74D70F5B-2B21-11D7-8648000102C1865D. ^ Trenhaile, A.S.; Pepper, D.A. ; Trenhaile, R.W. ; Dalimonte, M. (December 4, 1998). "Stacks and Notches at Hopewell Rocks, New Brunswick, Canada". Earth Surface Processes and Landforms. 23 (11): 975–988. doi: 10.1002/(SICI)1096-9837(1998110)23:11<975::AID-ESP916>3.0.CO;2-K.